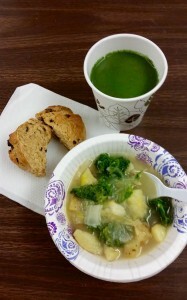 Hearty Soup, Irish Soda Bread and a Green Smoothie made up our yummy St. Patrick’s Day menu at the Greater Waltham Arc (GWArc). GWArc serves children, adolescents and adults with intellectual and developmental disabilities and their families, offering a variety of programs, services and supports which maximize independence, foster inclusion, promote self-advocacy and build community connections. These cooking classes are a great way to introduce healthy eating habits and have some fun! Chef Reva’s popular healthy cooking club at GWArc is held over several evenings; a daytime healthy snack program is also offered. Enjoy these recipes from our most recent class for you to try at home. Combine all ingredients in a strong blender. Blend until smooth; thin with water to reach desired consistency. If too thin, add more ice. We are delighted to announce our new partnership with the Waltham Public Schools, “Fresh! Chef to School visits,” which introduces students to healthy, tasty new foods in Waltham cafeterias. Please see our article for the Waltham News Tribune here (full text also below) to learn about this program. Check out more photos here. “I never thought eating healthy could be so much fun and taste so good,” said a Stanley Elementary school student after Healthy Waltham’s Chef visited her school. The culinary adventure program kicked off with chef visits to the Whittemore and Stanley Elementary Schools. Kids were excited to see a special display table with food samples, posters, and balloons. “We are excited to help Waltham youth experience something new and good for them. With 2,800 elementary school children in Waltham, the program will have a far reach across the community, ” says Healthy Waltham’s Executive Director, Pam Hess. The first samples students tried included a healthy granola with dried cranberries. “Cranberries add sweetness and are packed with Vitamin C. We were ecstatic when our school meals program got dried cranberries through the USDA commodities program. We know not all students have tried them so we thought it would be fun to come up with different recipes that feature cranberries,” said Liles. Chef Reva encouraged kids to keep an open mind to different foods. “Trying new foods is a great way to make healthy eating fun and find new favorite dishes, but sometimes it takes a few tries before you like something,” she said. “If you don’t like something, remember not to ‘yuck someone else’s yum’ – no saying yucky.” Judging from the way kids at Whittemore and Stanley gobbled up the cranberry granola, there were more “yums” than “yucks.” All kids trying the cranberries received “I tried it!” stickers. Kids learned a few new things about the cranberries too, such as that most cranberries are grown in Massachusetts, they grow in swampy areas called bogs, and they can be eaten in salads, baked goods, oatmeal, and served with vegetables. More about Healthy Waltham: Founded in 2003, Healthy Waltham promotes healthy eating and active living opportunities to Waltham residents through healthy cooking and gardening, physical activity and involvement in natural open space within the community. Healthy Waltham focuses on serving the most vulnerable populations: families with young children, recent immigrants, low income residents and seniors. We engage people through cooking classes, food demonstrations and gardening, walking clubs, and collaborations around healthy living. We go directly to where people are already gathered, making it easy for them to participate. To learn more about Healthy Waltham, visit, www.healthy-waltham.org, We can be reached via email at info@healthy-waltham.org. Healthy Waltham is a 501(c)(3) non-profit corporation. Chef Reva’s December workshop for seniors held at the Council on Aging focused on the butternut squash, with three different takes on this local favorite. Served hot, cold, or baked in a muffin, the butternut squash is a healthy addition to a meal. Healthy Waltham’s workshop series, titled “Cooking for one? Make it fun!” is geared toward seniors who may want to cook in smaller amounts or serve a food item over several days. The workshop series with Chef Reva will continue this winter; please contact the Council on Aging/Waltham Senior Center, 488 Main St., 781-314-3499, to sign up. Workshops are free to participants, but advance registration is required. Toss Brussels with just enough olive oil to coat and spread on a baking sheet. Sprinkle with a pinch each of thyme, rosemary, salt and pepper. Bake until browned and crispy and soft in the middle, 15-20 minutes. Roast it whole: Wash squash and pierce skin and multiple places with a fork. Wrap in foil, place on a baking sheet and bake until tender, about one hour. Cool before peeling, cutting and using in the following recipes. Cut in half: Remove a thin slice from the bottom of the squash and cut off the top part just below the stem. Stand squash upright on board and cut straight down the middle. Use a spoon to scoop out the seeds. Roast cut side down or slice into ½-inch thick pieces and roast as Brussels sprouts above. Note: peel will come off easily once cooked so there is no need to peel before baking. Combine roasted Brussels sprouts with roasted squash and enjoy. Combine lemon juice, apple cider vinegar, mustard, maple syrup and olive oil in a container or jar with tight-fitting lid. Add a pinch of salt and pepper; shake to combine. Toss greens and squash with enough dressing to coat. Top with roasted seeds and parmesan cheese. Preheat oven to 375F and prepare muffin tin by lining with greased papers or greasing only. Combine flours, oats, brown sugar, baking powder, salt, and cinnamon in a large bowl and stir to combine. In another bowl, combine eggs, yogurt, oil and squash puree and mix until smooth. Add prunes and ginger to wet ingredients and mix. Combine wet and dry ingredients and mix until just combined (no dry flour visible). Divide batter (it will be thick) among a dozen muffin tins and top with seeds (if using). Bake about 20 minutes until slightly browned and firm to the touch. 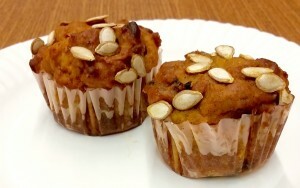 A toothpick inserted in the center of muffins should come out clean. Leave muffins in tin until cool enough to touch. Allow muffins to cool completely on a wire rack. Keep muffins in an airtight container or Ziploc bag. These muffins also freeze very well. Try a hearty but light soup that’s perfect for a chilly fall or winter day. 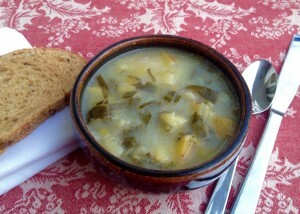 We made this soup recently for our Get Healthy and Fit seniors’ program at the Waltham Fields Community Farm. A group of about 20 seniors enjoyed touring and learning about the Farm. Then, they learned new techniques for preparing produce grown at the Farm from Chef Reva and tried some delicious recipes. We really enjoyed this collaborative program with the Farm and our wonderful participants. (You can see some photos here.) We will continue our Healthy Eating Workshop for Seniors this winter at the Council on Aging, 488 Main St. The next seniors workshop will be held on Wednesday, December 16, 1:30-3:00PM. It’s free, but please call the Council on Aging to sign up at 781-899-7228. We’re collecting button batteries like these found in hearing aids, watches, car keys, etc. Help get toxic button cell batteries out of the waste stream. Healthy Waltham is participating in a new partnership with the Waltham Recycling Department. Button cell-type batteries, commonly found in hearing aids, watches, car keys, and other small electronics, often contain mercury or other harmful substances that can be released into the environment when the batteries are discarded with regular trash. Now you can turn these batteries in to the Waltham Recycling Department, 165 Lexington Street, or at other locations in the city to benefit Healthy Waltham. Please see the following list of locations (would your organization like a collection box? Just let us know at info@healthy-waltham.org!). We will continue to add to these locations over the next weeks. Button cell batteries often contain toxic elements that are classified as hazardous waste. These batteries are sometimes overlooked because they are so small, but they can be harmful if they are not disposed of properly. Healthy Waltham, a local non-profit organization that provides support to Waltham families, is organizing a button cell battery drop-off program in conjunction with the Waltham Recycling Department. Button cell batteries are found in wristwatches, hearing aids, cameras, calculators, and even electronic car keys. Depending on the type, button cell batteries could contain mercury, cadmium, or lithium, all of which are harmful to the environment. The button cell battery recycling program is a benefit for Healthy Waltham, funded through Wheelabrator Technologies, the waste-to-energy combustion facility that burns Waltham’s trash. Wheelabrator works to divert all hazardous products from the trash. Because our garbage is incinerated at the Weelabrator Facility, button cell batteries should be diverted from the trash; burning them can release mercury into the air. Once airborne, mercury can leach into waterways and accumulate in fish, posing a threat to human health, and especially to pregnant women. It is crucial, therefore, to keep mercury and other toxins out of our trash, even in small amounts. Healthy Waltham has placed button cell battery collection boxes at the Senior Center at 488 Main Street, the Waltham West Suburban Chamber of Commerce at 84 South Street, and the Waltham Public Library at 735 Main Street, and other locations in Waltham (see the Healthy Waltham website for a complete list of locations). 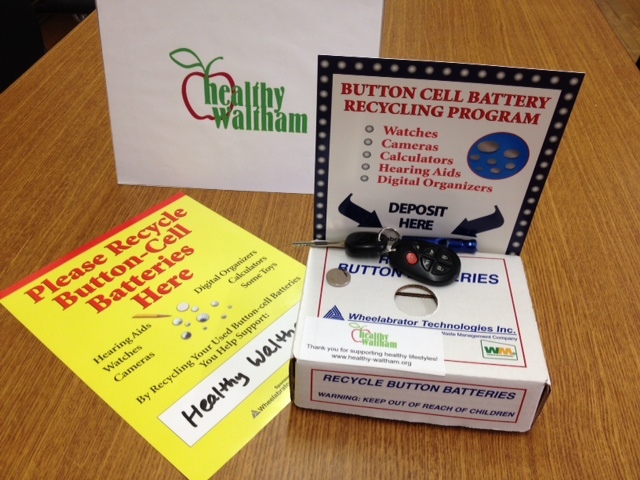 Healthy Waltham will receive a rebate from Wheelabrator for button cell batteries collected. You can also bring the button cell batteries directly to the Waltham Recycling Department, 165 Lexington St. Waltham, from 8:30am-4:30pm. Please support Healthy Waltham and the environment by helping to get the button cell batteries out of the trash and turn them in to be disposed of properly! Please note, we are collecting the button cell-type batteries only. Regular alkaline batteries (A, C, D) can be discarded in regular trash. For more information about Healthy Waltham, please see http://www.healthy-waltham.org. More information about the Waltham Recycling Department can be found at http://www.city.waltham.ma.us/recycling-department.